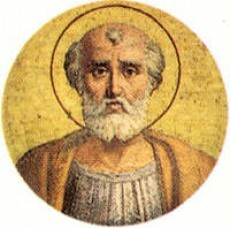 The birth of St. Callistus I (also referred to as St. Callixtus) is not known, however, we do know that he was Pope from 217-222. He was the Pope during the reigns of the Roman Emperors Elagabalus, and Alexander Serverus. The writings we do have of him came from his contemporary and enemy Hippolytus of Rome, the author of Philosophumena. He relates that Callistus as a young slave was put in charge of collected funds by his master Carpophorus, the funds which were given as alms by other Christians for the care of widows and orphans. Callistus lost the funds, and fled from Rome, but was caught near Portus. According to the information, Callistus jumped overboard to avoid capture but was rescued and taken back to his master. He was released at the request of the creditors, who hoped he might be able to recover some of the money, but was arrested again for fighting in a synagogue when he tried to borrow money or collect debts from some Jews. His health had become so weakened that his fellow Christians sent him to Antium to recuperate and Pope Victor I gave him a pension. St. Callistus was the deacon to whom Pope Zephyrinus entrusted the burial chambers along the Appian Way. In the third century, nine Bishops of Rome were interred in the Catacomb of Callistus, in the part now called the Capella dei Papi. The archaeologist Giovanni Battista de Rossi rediscovered these catacombs in 1849. Around 222, according to the apocryphal Acts of Saint Callistus, Asterius, a Priest from Rome, recovered the body of St. Callistus after it had been tossed into a well and buried St. Callistus’s body at night. Later, Asterius was arrested for this action by the Prefect Alexander and then was killed by being thrown off a bridge into the Tiber River. St. Callistus was honored as a martyr in Todi, Italy. He was buried in the cemetery of Calepodius on the Aurelian Way, and his relics were translated in the 9th century to Santa Maria in Trastevere. The fourth century Basilica of Saints Callistus et Iuliani was rebuilt in the 12th century by Pope Innocent II, and rededicated to the Blessed Virgin Mary. It is said to be built on the site of his martyrdom, which is a attested to in the 4th century Depositio Martryum, and is likely to be historical. St. Callistus’s life shows us that as a young man, he was a slave. He went on to serve the Church, and was the deacon to Pope Zephyrinus. His life shows us the struggles of the early Christian Church, and how hard they had it. He was entrusted by Pope Zephyrinus with the burial chambers along the Appian Way, where nine Bishops of Rome were buried and later discovered – thus making him the patron Saint of cemetery workers. The struggles that the early Church leaders went through, must be remembered to appreciate the wonderful Church we have today.